This is a shot from about a year ago on a weekend away in Dunsborough. 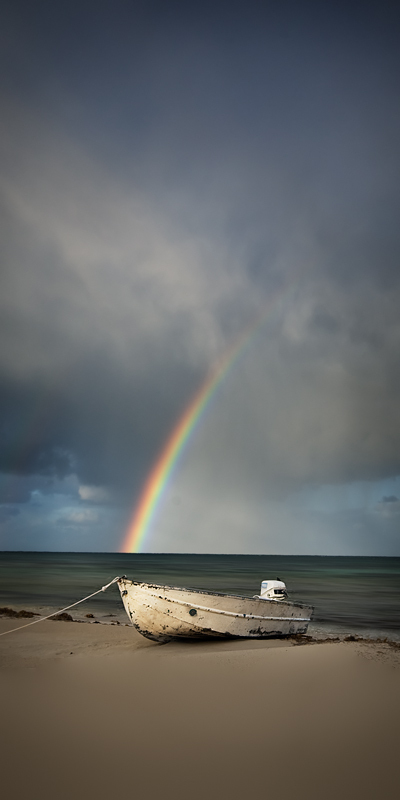 I went out onto the beach at Eagle bay to have a little wander around when suddenly this rainbow appeared. Ofcoarse my camera was still in the car about 300 metres away so I did the dash back to the car. The soft sand and rain didn’t help my running efforts at all. I managed to run, get the camera, and set up quickly for this shot just as the rainbow was disappearing. I was knackered! Although I missed out on the rainbow in all its glory as it stretched across the whole bay, I am pleased that the run was reasonably worth while. I had to post something. My blog has been almost dead, Dylan made me aware of that. So I thought I would post something. I am not completely happy with this shot but figure I have to start throwing up shots more regularly on here so that I can get some feedback. This shot was about a 6 image stitch from memory, just something simple. I am always drawn towards simple compositions. Simple things amuse simple minds maybe. I am hoping to get away for the long weekend, not sure where though at the moment. Will have to way everything up in the coming days.